We already covered how to build a squad based on a single league. Now, it’s the right time to move on to the next stage: the hybrids. 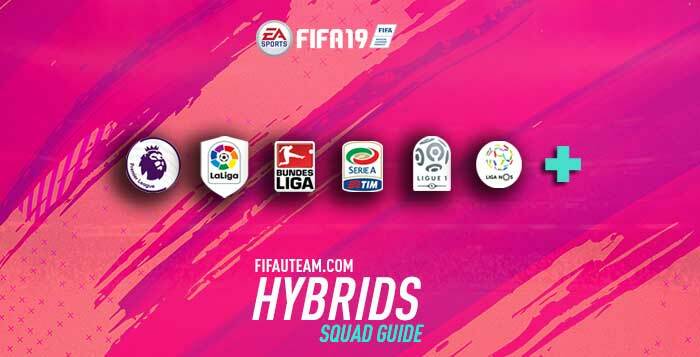 Follow us on this FIFA 19 Hybrid Squads Guide to learn what is a hybrid squad and if you should build one or not. We will also teach you how to create a hybrid squads with high chemistry. What is a hybrid squad? 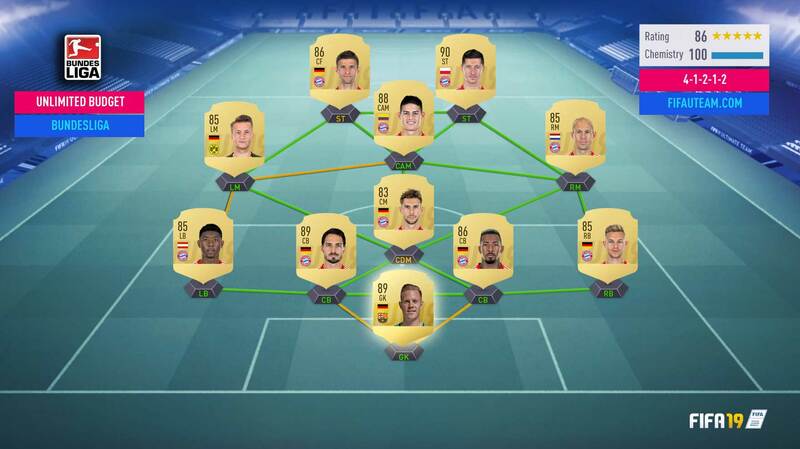 The concept of building virtual teams with your favourite players within the boundaries imposed by chemistry is a feature of FIFA Ultimate Team which is unique from other similar game modes. Although this constraint may not appeal to some, it adds another level of complexity and enjoyment to be found in building squads, and in particular hybrid squads, on FUT. Hybrid is a team which contains players from at least two nations AND at least two leagues. Before we go deeper in this subject, and to help who is starting in this hame mode, let’s clarify what is meant by some of these terms relating to building squads. The process of creating a team, usually with a certain goal in mind, to use in FUT. The squads which generally get the most attention are hybrid squads with more creativity being better. The starting XI which you plan to use on FUT. This excludes the bench/reserves. This refers to a situation where every single player in a team has at least 9 chemistry. Additionally, it also may also refer to a just single player having at least 9 chem. A whole squad may have 100 chemistry but it is not considered to be “full chem” if some players have less than 9 chemistry. The connection between two adjacent players on a team, shown with coloured lines on FUT game modes. The colours are indicative of the strength of the connection. It is impossible to explain what a Hybrid Squad is, without talking about Chemistry. 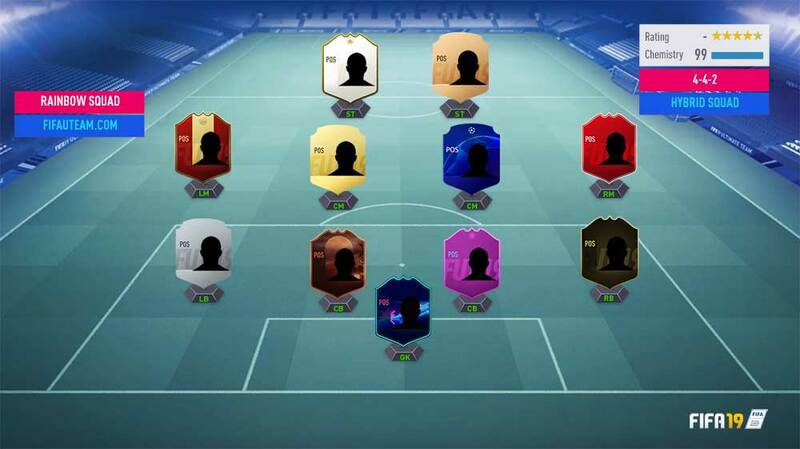 This is a system on FUT which determines how a player plays based on the similarities in background between them and their teammates. In real life, it is a measure of how well players playing for the same team get along. Often, a team plays well if the players know each other well as they can understand anticipate each other’s movement and play-style better, a concept which is reflected both in real life football and in FUT. In FIFA, EA has created a more simplistic way of measuring chemistry. This is a system which has existed in the past in offline game modes but is now exclusive to FUT. It is based around the league, club and country a player plays for. The stronger this connection is, the better the player will play. Note that if in a given squad, a player has a stronger link to one player compared to another, they will not pass better or make better runs with the stronger link than with their weaker link. The chemistry value of a player affects themselves only. Chemistry values vary between 0 and 10 based on how strong a player’s connections are, with higher values being better. It is strongly recommended that you use a player with at least 9 chem to allow them to play to their maximum potential. Any less and you will notice that their ability to pass, run, shoot and tackle won’t feel as good as it should be. To get a player on full chem, let’s introduce an arbitrary system to explain it. Links come in four varieties: weak, medium, strong and hyper (sometimes called perfect). Red/weak links are where two players play in a different league and come from a different country; they have little in common. This link will be assigned an arbitrary value of -1. Yellow/medium links exist when two players either come from the same country or play in the same league (but not both). Note that leagues existing in the same country does not count as being the same league (e.g Ligue 1 and Ligue 2). They have a little in common and will be assigned a value of 0. Strong/green links can mean one of two things. It can mean that two adjacent players come from the same country and play in the same league for different clubs or it means they play for the same club but come from different countries. This will be given a value of +1. Perfect links come about when two players from the same club and country are next to each other. 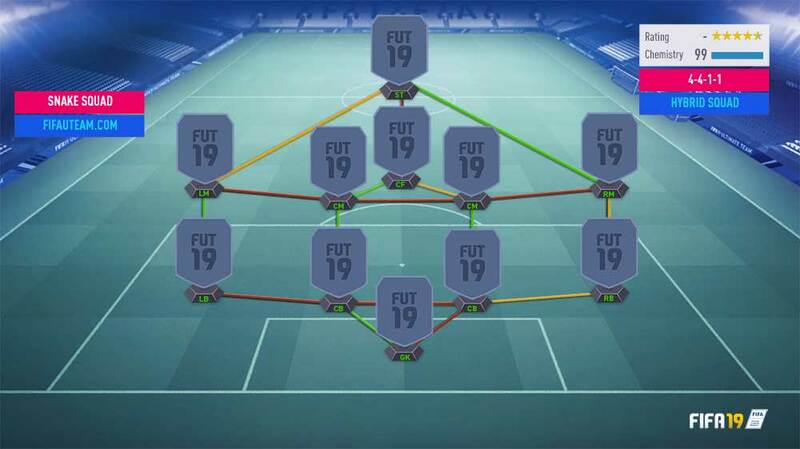 These links are the same green colour as strong links on FUT, but are often distinguished from strong links on squad building websites by being light green. These players have many similarities hence we will let this have a value of +2. To get a player on full chemistry, you only need to have his links add up to a value of 0 or higher. Anything more than 0 does not improve how the player plays. This means most players will build one league squads as this guarantees that everyone at least has an arbitrary value of 0 as there are no weak links between players in only one league. Alternatively, using players from just one nation yields the same result. However, this greatly reduces the potential of a squad and the ability to combine your favourite players if they play in different leagues and for different countries. A FIFA 19 Hybrid Squad can be of one of three types according to how difficult is to build: basic, moderate or complex. The most basic hybrid would involve incorporating just one player from a different league to the rest of the squad. Let’s imagine we are building an unlimited budget team in the Bundesliga. This league has a top-quality goalkeeper but we are free to try alternatives to Neuer. If we use and 4-at-the-back formation, we could create a situation where we can easily include a player from outside Bundesliga yet still maintain full chemistry on the squad. To achieve this, we could use German centre-backs from the league with a German goalie from abroad. Theoretically, if we added a player of this nature, on the arbitrary scale of chemistry, he would be 0 + 0 = 0 hence will be on full chem. For example, let’s consider the classic 442 formation where we will put Boateng and Hummels as CBs, the best defenders players in this league. This means we can now play Marc-André ter Stegen from LaLiga in goal. We have opened up a situation where we have tried another top-quality goalkeeper without affecting the rest of the team in terms of chemistry or quality. Also, the team now contains at least two nations and two leagues, hence can be called a hybrid, albeit a very simple one. These types of squads have a moderate level of hybridity and are probably the easiest way to put two players together who would normally have a weak link between them. This category covers a broad range of hybrids, like half-n-half teams and perfect links. You can learn more about these teams in the last chapter of this guide. Squad with no dead links. In other words, all links have to be yellow. Squad in which the green/yellow links form an end-to-end pattern called a “snake”. Squad formed by players from the three qualities: bronze, silver and gold. Also known as ’11 cards’, these squads feature eleven cards from different types. There are no two cards from the same type. Although these squads do not improve your gameplay of FUT, there is a certain level of prestige and respect within the FUT community associated with building and using these teams as they show that extra effort was put into creating the squad. It may also bring personal satisfaction to yourself if you can manage to bring together three of four of your favourite players from different nations and leagues into one squad, especially a NLW squad. We love hybrids but it doesn’t need to mean that they are better than squads based on a single league or nation. 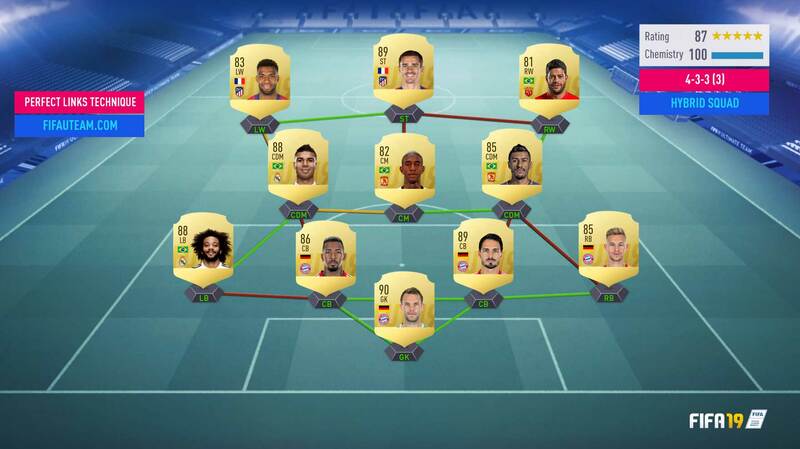 If you don’t know if you should build FIFA 19 Hybrid squads or not, analyse its main advantages and disadvantages. There may be many reasons for wanting to venture away from using just one league in a squad: the league has weaknesses in some position, the league is expensive compared to other leagues, your favourite players play separately and have nothing in common in terms of chemistry, etc. Hybrids enable you to get around these problems while allowing you to try out some players who you thought you would never use but turn out to be surprisingly good. Although hybrids may allow you more options when building teams, they have their share of issues. If a player gets injured/suspended/low on fitness, they may be difficult to replace while keeping your team on full chem, especially if it is a more sophisticated hybrid. Squad rotation is much easier with one league teams, whereas when using hybrids, it is more strongly recommended that you make two teams and alternate between them if these issues arise. In order to play two players together, you may be forced to use someone to link the players who you wouldn’t normally want use to but is the only option for getting a full chem team. Equally, if you use a hybrid team and find that there are a few players who don’t suit your style, it may be difficult to replace them and keep full chem especially if your hybrid is more complicated. Although a NLW hybrid might be impressive for you and your friends, it brings with it an inability to chop and change. In these cases, it may be better to completely rebuild the squad. Lastly, hybrids take time to build. If you feel like FUT is getting boring and want to rebuild your whole club, it takes longer to build full chem hybrids than it does to put together a single league or single nation team. By definition, a hybrid team is a squad built with players of different leagues and nationalities. 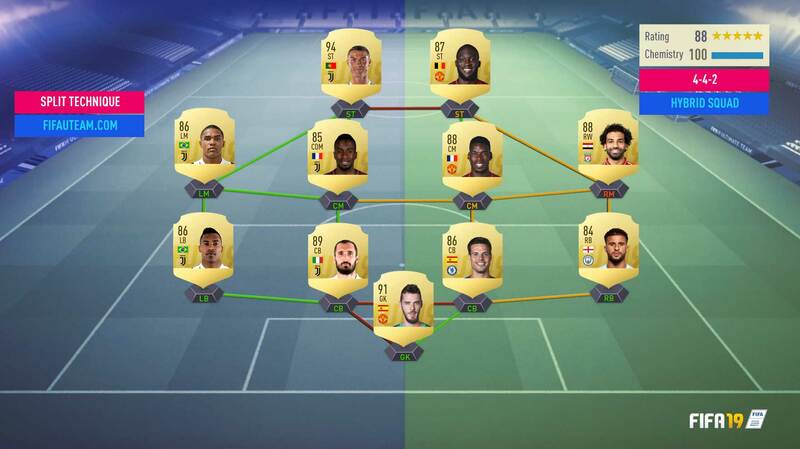 They are difficult to build and unless you already have some experience, you will spend lots of time trying to make a hybrid squad with high chemistry. We will share three tricks with you that will speed up the process. To show you how well this technique works, we have built a Serie A / Premier League hybrid. The right side of the team is filled with players of the English league and the left side is filled with players of the Italian league. 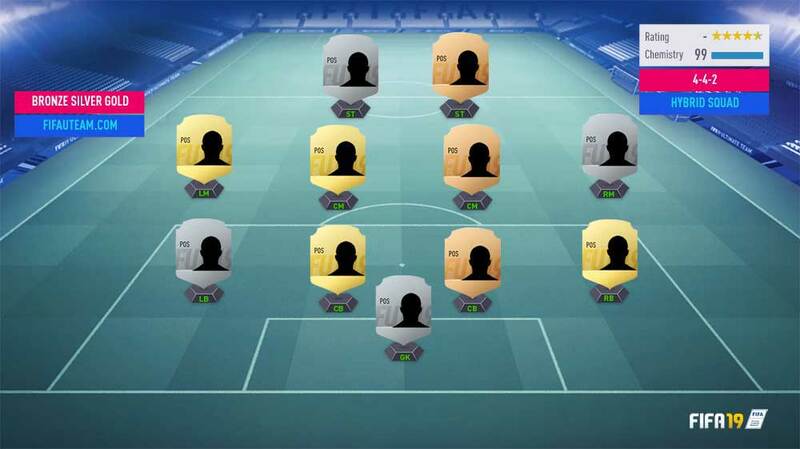 As you can see in the image below, all players have an individual chemistry of 10 after applying the loyalty bonuses. Every player that has a dead link, needs a strong or a hyperlink to reaches the maximum chemistry. If you look for Lukaku’s example, you will realize that he doesn’t play for Liverpool but he has the same club of Pogba. If you replace the French midfielder with Kanté, you wouldn’t keep full chemistry on this player. To see the individual chemistries, please click here. ✅ It may also be applied, splitting the team transversely, ie between the defence and the midfield. ❌ It is not possible to split teams into two parts for all the formations. ❌ The players who connect with the other half may need a strong link to reaches the maximum chemistry. There are some formations that are more favourable for building a hybrid team with high chemistry. It’s the case of the 4-2-3-1 formation, for having two key elements that allows split the team in two. These players should have characteristics that connect well with any of the two parts. In that way, it is possible to do something similar to the Squad’s Split Technique but the formation doesn’t need to be divisible and without the chemistry problems of the players that make the connection between the two leagues and/or two nationalities. To show you how well this technique works, we have built a hybrid squad with Spanish and Premier League players. The key players in this 4-2-3-1 formation are the two CDM’s. 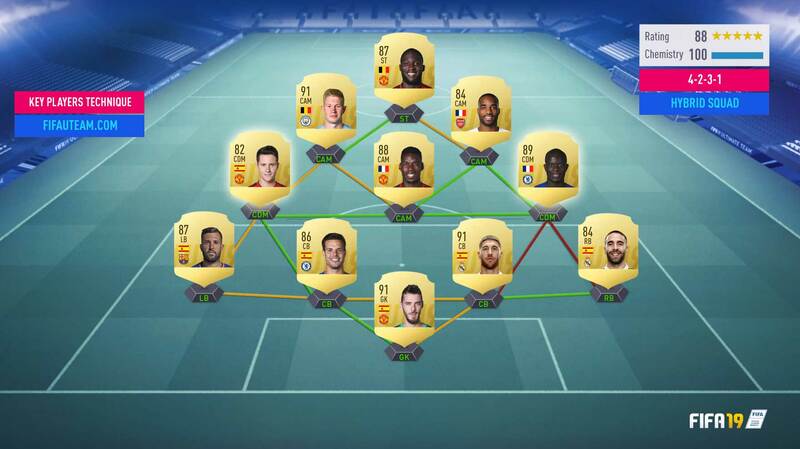 To choose a Spanish Premier League player it was enough to get the maximum chemistry to all players on the attacking side and all the Spanish players on the defending side. For many of them, it was not even necessary to place a manager. ✅ If the key players are well chosen, weak links will be enough in each one of the sides. ❌ There are just a few formations suitable for this technique. The most experienced players can build a team that apparently only features a few things in common between the players. Unlike others, the perfect links technique is not based on a league or nationality but on hyper links. The same is to say that each player needs to be linked, at least, with a team mate from the same country and same club. For players with three or less connections, a strong link is good enough. The squads of this technique are the most fantastic since it is possible to have more than 6 leagues and nationalities in a single team. To show you how well this technique works, we have built a hybrid squad with players from three leagues. There are several dead links (red), but we have reached the maximum chemistry for every player. If it was not your case, you should focus the manager bonus on the players with lower chemistry. For players with only two connections, the hyper link may be replaceable by a strong link or by two weak links, without damaging the chemistry. It was what happened to Hulk. This technique allows us to choose the players we feel more capable without thinking about their leagues and their nationalities. ✅ It allows the building of truly unique teams. ❌ The number of players with hyper links is limited. ❌ For players with four or more connections, the maximum chemistry can only be reached with other links and bonuses. have these untradables (Not necessary to use all of them) and 400k in the bank, any hybrid squad ideas please rodrigo. It will not be easy to get maximum chemistry with those 3 players from different nations and leagues. You will need players with hyper-links or at least making the bridge between them (Messi for example links with Dybala and Griezmann). Hi. What’s the problem with your current squad?